"When the sabbath was over, Mary Magdalene, Mary, the mother of James and Salome bought spices so that they might go and anoint him. Very early when the sun had risen, on the first day of the week, they came to the tomb. They were saying to one another, "Who will roll back the stone for us from the entrance to the tomb?" When they looked up, they saw that the stone had been rolled back; it was very large. 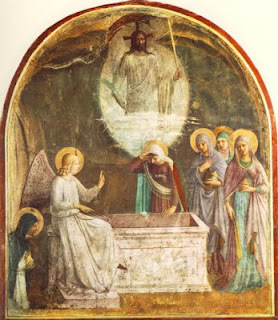 On entering the tomb they saw a young man sitting on the right side, clothed in a white robe, and they were utterly amazed. He said to them, "Do not be amazed! You seek Jesus of Nazareth, the crucified. He has been raised; he is not here. Behold, the place where they laid him. But go and tell his disciples and Peter, 'He is going before you to Galilee; there you will see him, as he told you.'"